Today at Robert Gibbs' first press conference as President Obama's Press Secretary he finally put the controversy to rest. "The President has a BlackBerry through a compromise that allows him to stay in touch with senior staff and a small group of personal friends in a way that use will be limited and the security is enhanced to ensure his ability to communicate, but to do so effectively and to do so in a way that's protected." So that's it. He'll keep the blackberry. Only a few folks will have the email address. Most everything sent and received on it is subject to the Presidential Records Act. Barack Obama may have been (as per usual, no official comment) provided a secure device that will allow him to stay connected, via email and voice. I was complaining last week about the possibility of surrender to this security problem. It appears that there was an answer available and the right people just needed to talk. The device he is most likely to use (there are other available, but this is the closest match) is the the Sectéra® Edge™ SME PED from General Dynamics. It offers "Secure Communications Interoperability Protocol (SCIP), allowing secure phone calls to be made with existing SCIP compatible devices. 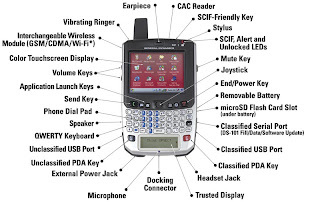 It also implements High Assurance Internet Protocol Encryptor Interoperability Specification (HAIPE® IS) to provide secure connectivity with classified networks (including the TACLANE® family of network encryptors)"
It's not an actual blackberry device, which may or may not be a big deal, but it looks pretty close in physical layout. It is based on Windows Mobile, so that will be a huge change from the Blackberry OS. Also, the device is HUGE. Based on the published specs, it is 3.2" wide, 4.9" tall and a whopping 1.3" thick. That's about a half inch taller and wider than a Blackberry 8800 and nearly three times as thick. And it weighs 12ozs, also about 3 times what an 8800 weighs. That will make the unit feel like a brick, for sure. Here's a diagram of the components. It looks to be extremely capable. If you know me at all, you know how excited I am about the election of Barack Obama as POTUS. I am also very excited about seeing him sworn in on January 20th. I live in the Northern Virgina area and work inside the Beltway. I would absolutely love to go to the inauguration and see the historic event first hand. That said, there is no way in the world that I would go downtown to the event. I'm not being an old fart. I just feel that if I am going to end up watching the event on a huge TV, I may as well do that in my own home. Plus, I think don't think it is helpful to put any additional burden on the local services that are already being stretched thin by this event. So here is my plan for making a positive impact during the inauguration. 1) I will stay at home. I will not burn gas, and avoid adding more CO2 emissions to the already ailing planet. I won't be clogging up the streets or Metro system attempting to get close to an outdoor TV. I won't be adding to the stress on the local services. 2) I will watch (and TiVo) the event. 3) I will buy at least one item that is advertised during the event. Nothing huge. Ford would love it if we could all buy a new Mustang that day, but I'm thinking smaller. If we all commit to buying a single item, made in the US, or supporting a US industry, that we had not planned to purchase anyway, how much of an impact could that have? So that is my plan anyway. What are you going to do on January 20th to make an impact? There are plenty of reasons why President-elect Barack Obama is being advised to give up his blackberry. I fully understand the issues surrounding presidential records, but I think the security issues are just FUD. 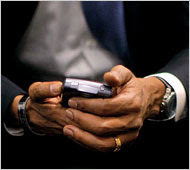 Are we really, as IT and security professionals, saying that the President's Blackberry can't be secured? Are we saying that the best minds available can't find a way to ensure that the President can securely communicate? Are we also saying that we can't place filters and rules on the mail server to ensure that certain documents and messages don't get sent to the blackberry? Are we, as a group, giving up on the security of that device? Are we giving up on message security in general? And what are we giving up? We are potentially giving up a chance to have a president that is connected. A president that can get beyond the White House bubble that has insulated too many presidents. We are potentially giving up having a president that can truly understand the reality of life in America post "GWB, Inc." The biggest lesson we should learn from the last administration is that an insulated, out of touch President, is a bad thing. Bad ideas, bad decisions, bad consequences. If we are giving up on this effort, then I am ashamed to be member of the community. What does giving up say about the state of the industry? And what does it say about the security of modern electronic communication? Should we really be promoting the use of smart phones and other devices for federal leaders? Should we be relying so heavily on devices that we really don't trust? We need to look long and hard at this.